The Zion Fire and Rescue Department is pleased to provide FREE My Medical Information kits to our senior citizens, those with special needs, and others in the City of Zion that may need them. 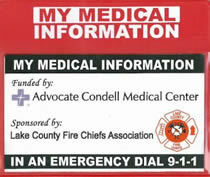 These kits were funded by Advocate Condell Medical Center and are sponsored by the Lake County Fire Chiefs Association. To obtain your FREE My Medical Information kit, contact Administrative assistants Mary Hudson or Lorrie Minghi at (847) 746-4038, Maryh@zion.il.us or LorrieM@zion.il.us, Monday thru Friday, 9:00 AM to 4:00 PM. Provide your name and mailing address, and they will mail you a kit. You may also stop by our Fire Station One at 1303 27th Street to pick one up.